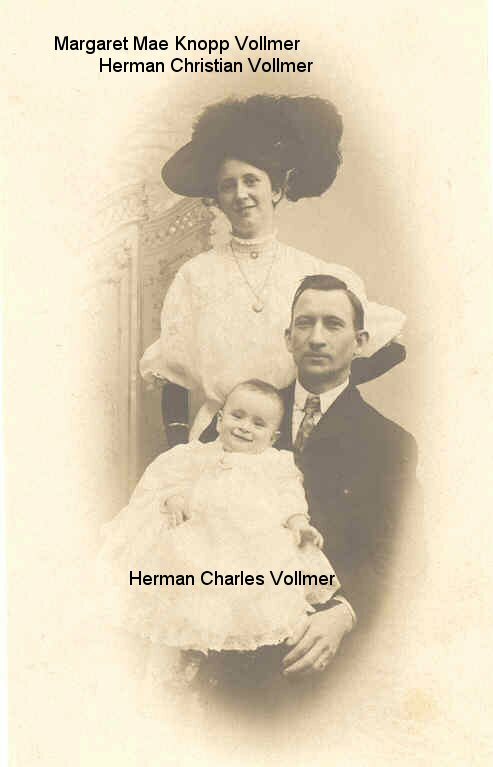 MARRIAGE* 4 June 1906� She married Herman Christian Vollmer, son of Jakob Friederich (Frederick) Vollmer and Anna Catherine Jacob, on 4 June 1906 at Holy Trinity Church, Washington, D.C., Holy Trinity Catholic Church located at 3514 O St., NW in Washington, D.C. Its likely that Margaret Mae met Charles Knopp while working as a helper in a bakery. On the 1900 census her occupation is listed as "helper in bakery". 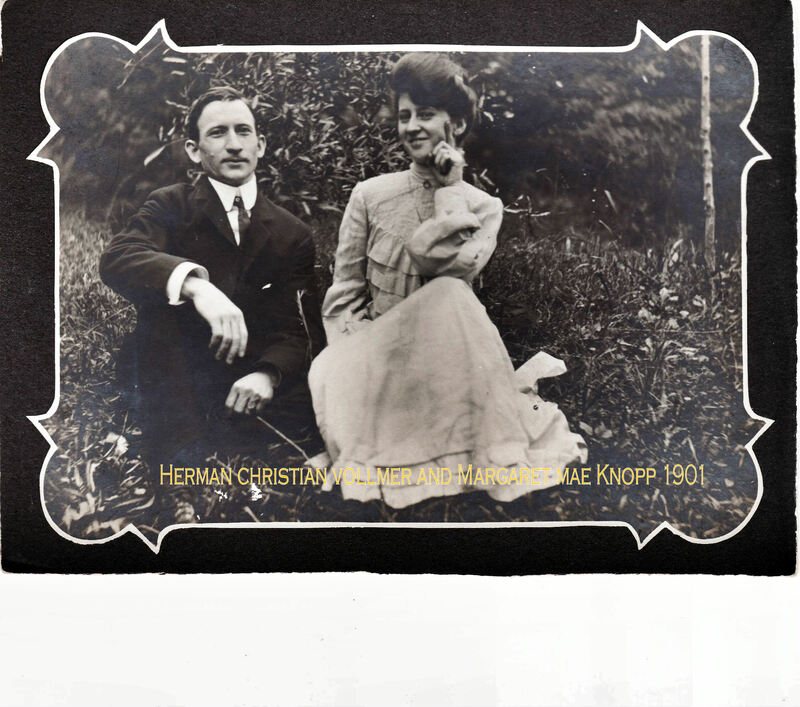 MARRIAGE* 4 June 1906� She married Herman Christian Vollmer, son of Jakob Friederich (Frederick) Vollmer and Anna Catherine Jacob, on 4 June 1906 at Washington, D.C., Holy Trinity Catholic Church located at 3514 O St., NW in Washington, D.C. Its likely that Margaret Mae met Charles Knopp while working as a helper in a bakery. On the 1900 census her occupation is listed as "helper in bakery". [S81] Margaret Mae Vollmer, Margaret Mae Vollmer. [S61] 1920 Census;, Name is mispelled as Vollmar. Will states that George is deceased with only surviving children being Margaret and Helen. One researcher thought name was Thomas, but subsequent research found name of Peter/Patrick. Biography � This document is a compilation of Margot Woodrough’s Lendrum narrative with the time line on Landrum developed by Linda P. Landrum 12907 Jadestone Dr. Sun City West, AZ 85375-3241. Her notes are in italics. Thomas Lendrum Sr. is called both a lawyer ( Note from Linda P. Landrum dated August, 1998 states: Reverand Thomas got his college degree in Scotland and it was eight years between that and the time he appears in Virginia. Since his father was a burgess in Scotland makes one think that Thomas was born in Scotland. ( Linda Landrum descends from James the emigrant discussed at length in Joel Shedd’s book, but Linda feels that Parson Thomas was NOT a descendent of James, but could have been a nephew or more likely a cousin) (“Original Scots Colonists in Early America, by David Dobson states: Thomas Lendrum settled in Port Royal, VA, child was Thomas Keity Landrum) in Joel P. Shedd’s book, the “Lendrum Family of Fayette Co., Ga.”, p. 32. Thomas Sr. was either an immigrant or a native born Virginian, and there is evidence for both cases. If he was an immigrant, he well could have been the Thomas Lendrum mentioned in the Order Book for Caroline Co., Va., dated Feb. 8, 1750, wherein he secured fifty acres of land according to Royal institutions, by which each newly arrived settler was entitled to such a grant from the Crown. On the other hand, if he was a native born Virginian, as indicated in the family tradition which says that the Lendrums came from Scotland in 1680, then who is the father? Joel Shedd’s book casts no light on this problem. Officers & Graduates of Kings College, Aberdeen, 1495-1860, by Peter J.
etc, to plead at the County Courts, took the oaths and subscribed the Test. Obad. Marriot, Thomas Lendrum, Henry Lee. Lodge # 4, and a dozen times in the next few years. Apprentice) at Fredricksburg Lodge # 4.
who met to form what was then an unchartered lodge of masons on 12 Apr 1754 . He was among the first to earn the Master Mason Degree in the Lodge on 12 Jan 1756, and also served two terms as Grand Master of the Lodge (1761-1762). A copy of Thomas Landrum's signature appears on the by-laws of the Kilwinning Port Royal Crosse Lodge. Biography* 1680� The Landrums came from Scotland and settled in Westmoreland Co., VA in 1680. In 1750 320 headrights were purchased by John Madison, Thomas Landrum (lawyer), Dr. John Shores, Robert Scott. He was obvioulsy a man who valued education as he wrote a codicill to his will instructing that "As the profits of my son or sons shares of my estate may not be sufficient for his or their education, I would by no means confine my executors or their guardians to our laws in that regard, but impower and even desire them to expend every Penny of their fortunes on it if my wife can be prevailed on to part with them which I trust she will. Thomas Lendrum Sr. is called both a lawyer and a parson in Joel P. Shedd's book, the "Lendrum Family of Fayette Co., Ga.", p. 32. Thomas Sr. was either an immigrant or a native born Virginian, and there is evidence for both cases. If he was an immigrant, he well could have been the Thomas Lendrum mentioned in the Order Book for Caroline Co., Va., dated Feb. 8, 1750, wherein he secured fifty acres of land according to Royal institutions, by which each newly arrived settler was entitled to such a grant from the Crown. On the other hand, if he was a native born Virginian, as indicated in the family tradition which says that the Lendrums came from Scotland in 1680, then who is the father? Joel Shedd's book casts no light on this problem. The best hunch, until more evidence appears, is that Thomas Sr. was newly arrived from England, and that he was one and the same as the Lendrum mentioned in "Dictionary of Scottish Immigrants to the U.S.A." by Whyle, p. 200. The book states that Lendrum arrived in Port Royal, Va. before 1784, and that he was the son of Thomas Keith. (S.H. #2778) the SH means Service of Heirs) If this fact is true, it would help to explain the family tradition which includes the name Keith in that of Thomas Lendrum, even when there is no documentary proof for this name. Possibly, the same Thomas that arrived in Port Royal was the same as the Thomas who, on February 8, 1750, along with others, "made oath that they came immediately from Great Britain into this colony to dwell, and that this ye first time of their having proved the same in order to entitle them to 50 acres of land according to Royal institutions, and that the said persons severly assign their rights to James Madison, Gent." as shown in the Order Book of Caroline Co., Va. It would then, also, be likely that the recent immigrant, Thomas I, was the lawyer and parson who was admitted to the practice of law at Port Royal in 1749. This latter Thomas, being the same man who wrote a will in 1764, probated in King George County, Va. in 1771. The will named his son, Thomas II. The following are notes from a geneologist (name unknown) found on the internet. They are included here because they support as well as illuminate what was already known of Thomas Landrum. 8 Sep 1749 Thomas Landrum, Gent, produced a license from Peyton Randolph Esq, etc, to plead at the County Courts, took the oaths and subscribed the Test. 6 Apr 1753 Thomas Landrum attended meetings of Masons at Fredricksburg Lodge # 4, and a dozen times in the next few years. 12 Jan 1754 Thomas Landrum, ‘became a member’ (probably made Entered Apprentice) at Fredricksburg Lodge # 4. 12 Apr 1754 Thomas Landrum, at a meeting of Free & Accepted Masons, listed as visiting brethren, at meeting of Port Royal Kilwinning Crosse Lodge # 2; signed first by-laws. 10 Dec 1760 Thomas Landrum elected Master of the Lodge, Kilwinning Crosse Lodge 2-237, Port Royal, Caroline County, Virginia, served as Master of the Lodge apparently until 1763. 25 Feb 1765 Thomas Lendrum, Hanover Parish, Virginia, writes a letter of recommedation for holy orders for Mr. George Goldie. 1771 Thomas Lendrum, Admitted as an Attorney in King George County Court in 758. Went to England for ordination 1764. Licensed for Va April 3, 1765. 5 Sep 1770 Called meeting of Masons of Kilwinning Crosse Lodge 2-23 7, Port Royal, Caroline County, Virginia for funeral of Thomas Landrum. The corpse appeared to have been at the home of Robert Gilchrist, & from there procession went to the cemetery. Alexander Rose & John Skinker, Gentlemen, executors, & said Robert Inness guardian of my children. No Date Rodham Kenner against Thomas Landrum, administrator of Nelly Landrum. 24 Oct 1780 Nelly Landrum, widow, administratrix of the last will of Rev.Thomas Landrum, decd, sells one slave to Dr. John Tennant of Port Royal. 8 Dec 1809 Maryanna Stone in the house of Samuel Stone on 8 Dec 1809 states that a few days before the sale of her deceased mothers estate, she gave her sister, the wife of Rodham Kenner, feathers to make her a good bed. 11 Dec 1809 Thomas Landrum of Westmoreland county states that Rodham Kenner married a daughter of Nelly Landrum and is entitled to a part of her estate. 8 Dec 1809 Robert Kay states that on 8 Dec 1809 he was at the sale of Nelly Landrum’s estate and that Thomas Landrum demanded bonds from Samuel Stone and Rodham Kenner for their purchases. Marianna Stone wife of Samuel Stone and Peter Landrum. On 24 Oct 1780 Nelly Landrum sold a slave to John Tennant (now dead) and his wife Sarah Tennent. Nelly Landrum died in Dec 1803.
married to his sisters and that the will of his father was dated 1 Aug 1764. Will* 5 August 1764� He left a will on 5 August 1764 at VA He made this will in anticipation of a voyage back to England. Evidently he was rather young as his wife was pregnant at the time will was made. He specified that he wanted his sons educated as parsons or doctors "for I will by no means intail on them the drudgery of the Law'. In the name of God Amen. Wereas I intend God Willing in a few days to sail for Great Britain from whence perhaps I may never return, I think it proper to make my Last Will and Testament which I do in the following manner In the first place I subject all my real as well as personal Estate to the Payment of my Debts; and for that purpose I devise my Lots in Port Royall, and the Reversion in the Land I lately bought of Thomas Sullinger after the Death of his mother to my Exucutors and the Survivors of them with full Power and authority to them to sell and convey the same or either of them. as they shall Judge to be most to the Interest of my Family. After my Debts are paid as I have Great Confidence in the discretion and Motherly affection of my wife, I devise to her all the Residue of my Estate for the Support of Her and my Children. During her life in Lieu of her Dower requesting her to use as much of it as She can possibly spare on the Education of my Son Thomas Keith, and the Child Shee is now with if a Son to Qualify them for Parsons or Doctors (for I will by no means intail on them the Drudgery of the Law.) and the charge of their Education I particularly Recommend to the Reverend Robert Innes and Alexander Ross who I am confident will take care that they shall have a~virtuous and Religious Education tho perhaps their share of my Estate may not afford them ~ learned one. [S33] David Dobson, Original Scots Colonists of Early America. EMAIL* � Here is an interesting message worth saving for further research:I'm really sorry about how much trouble it has taken to send such a relatively simple email. Quite simply, the original 'thank you' was about thanking you for getting back to me so quickly. While I pride myself on how quickly I can go through the originals of 17th and 18th century Virginia documents, I really struggle with the Scottish documents of the same years. I had only gotten halfway through verifying the data that I had on those early Lendrums, when your email came in with the suggestion that the Margarets were mixed up. By the way, I agree with that conclusion. The papers that I had from the Scottish archives were, among others, the settlement papers of Patrick Lendrum's estate. One of the main points of that exercise was to name all of the then existing heirs. That is not to suggest that what Heather has to say is not interesting. In the first place, I had never heard of any Lendrum's as far north as Kirkwall before. And her usage of primary evidence, such as the register of deaths, leaves it in very good stead, as far as the reliability of evidence goes. I was also particularly interested in her naming William as the father of Peter. One of the nuggets that Diane Baptie, the Scottish researcher I hired to get me the copies of Peters estate settlement, was an abstract of the will of a William Lendrum of Logie Buchan. Diane sent it to me because one of William's heirs was a Peter Lendrum. As I recall, William's will was 1726 -- this would suggest that it is possible that the Peter named in William's will could be Peter, the father of Thomas Lendrum of Port Royal. However, it was no more than that -- there was no more that the coincidence of name and age -- no real proof of kinship. If Heather has better evidence, I would be interested in seeing it. I was also interested in her identification of Donald as the father of Helen Farquharson. I had seen in the OPR in IGI where Peter Lendrum and Helen Farquahrson were married 12 Nov 1719 in Foveran. I checked my 1696 Aberdeenshire poll books for Foveran and found a Donald Farquahrson -- who I guessed was Helen's father. Do you know if Heather has any primary evidence that Donald is Helen's father? Also in the errant email was thanks for asking after my book. It is written, and in the can. However, I want to hire a professional editor, who is familiar with the period, and that part of Virginia, to edit it. Aside from wanting to put out a work of quality, it is really necessary. I spend a good portion of my book pointing out the shoddy and misleading research of others. I need to be on very firm ground, myself, especially if I am going to take others to task for their misleading publications. So when I save the funds necessary for the effort, it will go forward. This document is a compilation of Margot Woodrough’s Lendrum narrative with the time line on Landrum developed by Linda P. Landrum 12907 Jadestone Dr. Sun City West, AZ 85375-3241. Her notes are in italics. 4, and a dozen times in the next few years. recommedation for holy orders for Mr. George Goldie. 1758. Went to England for ordination 1764. Licensed for Va April 3, 1765.
appeared to have been at the home of Robert Gilchrist, & from there procession went to the cemetery. The best hunch, until more evidence appears, is that Thomas Sr. was newly arrived from England, and that he was one and the same as the Lendrum mentioned in “Dictionary of Scottish Immigrants to the U.S.A.” by Whyle, p. 200. The book states that Lendrum arrived in Port Royal, Va. before 1784, and that he was the son of Thomas Keith. (S.H. #2778) the SH means Service of Heirs) If this fact is true, it would help to explain the family tradition which includes the name Keith in that of Thomas Lendrum, even when there is no documentary proof for this name. Possibly, the same Thomas that arrived in Port Royal was the same as the Thomas who, on February 8, 1750, along with others, “made oath that they came immediately from Great Britain into this colony to dwell, and that this ye first time of their having proved the same in order to entitle them to 50 acres of land according to Royal institutions, and that the said persons severly assign their rights to James Madison, Gent.” as shown in the Order Book of Caroline Co., Va. It would then, also, be likely that the recent immigrant, Thomas I, was the lawyer and parson who was admitted to the practice of law at Port Royal in 1749. This latter Thomas, being the same man who wrote a will in 1764, probated in King George County, Va. in 1771. The will named his son, Thomas II. shares of the estate are inadequate. Colony 'in my Family', and the rest of it a small distance from him . studied together for the 4 years mentioned in the letter of recommendation. 1. December 30, 1779 he was allowed 18” of brown sugar. 24 Oct 1780 Nelly Landrum, widow, administratrix of the last will of Rev. 1784 Thomas Keith Lendrum inderits the share left to his father, Peter/Patrick.Peter was described of once of Colliestown, lately Burgess of Old Aberdeen. The land that thomas Keith inderits is called Symon’s Croft, lying in the Seton parish of Old Machar and sherriffdom of Old Aberdeen. Data goes on to mention the rest of family. a. In 1834 John Cannady of Fauquier Co., Va. states that Thomas Landrum was a surgeon’s mate who stayed with the “Tempest” until it was abandoned by the crew when the enemy took command of the River (James) and finally the vessel. Thomas had been on board at least two years and ten months prior to the capture of the “Tempest”. b. In 1834 Charles Hayden of King George Co., Va. stated that he knew Thomas Landrum and also the fact that he died in Westmoreland County, Va., and was the son of Parson Landrum of King George Co. Both Thomas Landrum and Higdon (wonder if this should be Hayden. If so its an error made by MVW when her original notes typed in the 1970’s) grew up in the same area. 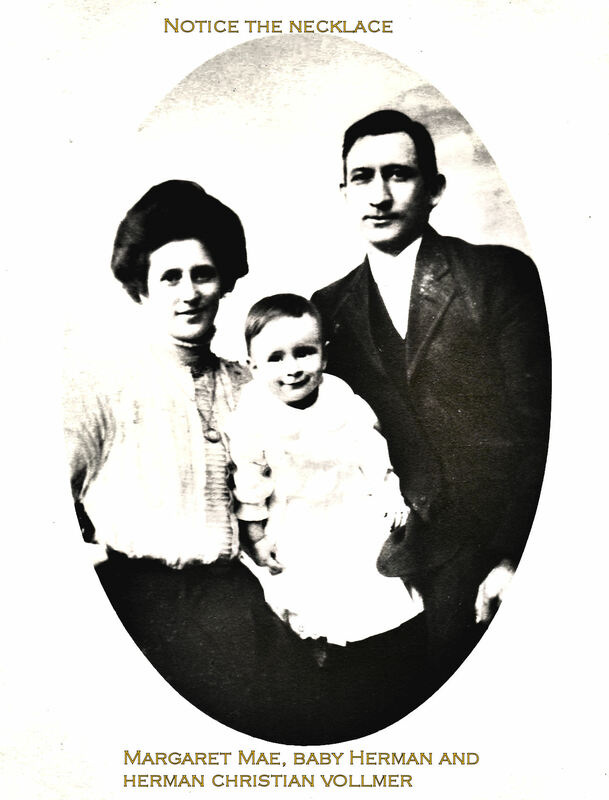 Thomas Landrum married after the war and lived in Leedstown in Westmoreland Co., Va.
c. William Stoke Jett (note that Thomas Lendrum’s wife was named Margaret Stoake.) likewise made an affidavit in which he states that he was acquainted with Thomas Landrum, the son of Parson Lendrum of King Geo. Co., Va. He too says that after his marriage Thomas resided in Port Royal, Caroline Co. and practiced medicine. Later he moved to Westmoreland Co. where Jett was living. William Jett recalls the anecdote wherein Landrum was called upon to perform an amputation, his first, while in service on board the “Tempest”. Following the Revolutionary War, Thomas married Margaret Stoake. It would be reasonable to assume that the wedding took place sometime between 1788 and 1790. If this date, and his presumed birthday are correct, then Thomas was probably in his mid thirties when he married. (Family stories indicate that Thomas Lendrum’s wife was named Buckner but his will clearly calls her Margaret Stoake.) In fact, the name Buckner has persisted in the family up until the early 1900’s, but to date no record is found of a connection with the Buckners. Perhaps the name belonged to either Margaret or Thomas’ mother. Landrum sold a slave to John Tennant (now dead) and his wife Sarah Tennent. sister, the wife of Rodham Kenner, feathers to make her a good bed. married a daughter of Nelly Landrum and is entitled to a part of her estate. and Rodham Kenner for their purchases. Elizabeth had quite a job ahead of her and evidently it became necessary for her to enlist the aid of her congressman, J. Taliaferro, in an attempt to collect Thomas Lendrum’s pension. Apparently there was some dispute as to when Thomas Lendrum actually terminated service, the Va. State Navy having been reduced in number prior to the close of the war. It was initially presumed that Thomas was relieved of duty at this time ________. However, it soon became apparent that two ships were retained in service past the date of reduction, these being the “Tempest” and the “Tattler”. There are three affidavits in Thomas Lendrum’s “half-pay” file which state that he was on board the “Tempest” as Surgeon’s Mate. That being the case, J. Taliaferro was able to use the following facts from a similar case to cause the pension office to grant a pension, which allowed for Lendrum’s service from the date of the ship’s capture. The Captain of the Tempest was named Markham and he was made prisoner when his ship was captured in Hampton Rhodes. His heirs filed suit in the Virginia Court of Appeals for half-pay and won. Taliaferro requested that the war department grant the same right to Thomas Lendrum, since it was proved that he, too, served on the vessel until it’s capture and so should be entitled to the same rights as the captain. Having won the initial battle for the “half-pay” pension, and presumably having exhausted the funds received, Elizabeth Collins again became active in the pension case in 1845. She reopened the issue by requesting that half-pay be allowed from Nov. 30, 1781, the date on which Thomas Lendrum terminated service (?) until April 22, 1783, the date on which the original pension had commenced. She was successful, as shown by a letter dated Sept. 17, 1845, from the Pension Office in Washington which allowed the heirs an additional 91.25 per year for the extra 18 months, a total of $127.00. All of these proceedings had a two-fold effect. Initially, they granted a living to a widow and her two maiden sisters. (Harriet B. Lendrum was listed as head of the household in 1850 in Va. census and family letters indicate that she lived with Elizabeth, her sister.) The long range effect was to bring to the present the vital information necessary to establish which of the two, and possibly three, Thomas Lendrums of Virginia was the real ancestor of Lillie Hudson Lendrum. Lillie had filed D.A.R. papers on _________, stating that her descent from one Thomas Lendrum of Virginia. The papers contained only that grain of truth. Lillie was in error in most other respects, and it took the combination of the Virginia State Navy half-pay file and some personal letters found in the attic at “Beechwood” to establish the true identity of Thomas Lendrum, Surgeon’s Mate. 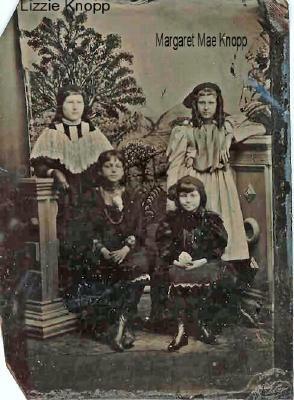 The available evidence concerning the immediate heirs of Thomas Lendrum indicate that the three girls, Elizabeth L. Collins, Harriet, and Lucy E. Lendrum all remained in Virginia. Walter T. Lendrum attended West Point, married, raised a family, and served in the Mexican War. Possibly, he lived for a time in New York. Here are the texts of two letters which came from the attic at “Beechwood”, the home of Lilly Hudson Lendrum Blakelys’ son, Stephens Laurie, which is located in Kenton County, Ky.
Family stories say that John B. Lendrum, the son of Dr. Thomas Lendrum, went to Kentucky, Campbell County, around 1829-1830, and that he was born Aug. 19, 1804 at Oak Grove in Westmoreland Co., Va. However, the 1850 census for Kenton County, Ky. shows John B. Lendrum as age 39, which would place his birth at 1811. In either case, he married and started a family rather late. (As also did his father Thomas Lendrum Jr., which explains what at first seemed a gap in generations.) By 1850 John appears in the 3rd Ward of Covington, Kenton Co., Ky. His occupation is City Clerk and he resides with his wife, Elizabeth (Rudd) who is age 29 and is a native Kentuckian. They have two sons, Thomas W. age 3, and evidently named for his Uncle, and the infant Harry Stokes, age 1. The family is wealthy enough to include a maid named Mary Roe, age 17, who came from Germany. Since John B. Lendrum did not marry his wife until 1846, at which time he was either 42 or 35, both of which are a bit old for the day, he must have quite a past waiting to be discovered. INSERT J.B. LENDRUM PICTURE HERE. By the year 1861 John Lendrum was living on Garrard Street, between Third and Fourth, in Covington, Ky. and is called, in the Cincinnati City Directory, a general agent e.s. ( don’t know what es means – need to look up) His daughter, Lillie Hudson, who was born Sept. 13, 1852, was by this time, nine years old. Her future husband, Laurie J. Blakely, has just arrived in town at this time ( Not so sure about this date for Laurie need to double check)(1861) for he is listed, also, in the same City Directory as -------------. The court records for August 28, 1862 show (order book 1, p. 316) that John B. Lendrum produced his commission as justice of the peace for the 1st District of City of Covington. In 1871 when the Directory was published, the Lendrums were living at the N.W. corner of Greenup and Fifth Street and John B. Lendrum was employed as a store keeper at Wessel’s and Schultz. By now, son Harry S. was serving as a clerk at the Post Office, at 86 E. Fifth Street in Covington. Harry was later to marry Sarah Morrison, move to Brooklyn, N.Y. and produce six children: Ralph Hemmingway, Harry Stokes Jr., Paul Grant, Earl Randolph, Victor Stephen and Lillian Hudson. The other son, Thomas W. disappeared and is reported through family tales to have gone to prison for embezzlement, a great source of embarrassment to an otherwise outstanding family who practically pioneered Covington, Ky.
ORANGE BLOSSOMS No sweeter lady was ever wedded to a worthier or genial gentleman than when Miss Lillie Lendrum was wedded to Mr. L. J. Blakely. The marriage was celebrated in simple, pretty style at the home of the Bride’s parents, #619 Scott Street, yesterday afternoon at 3 o’clock. Father Ton Major, of Cynthiana, officiating. The bride looked indisputably lovely in her pure white attire, ornamented with natural flowers; and the groom was as handsome as handsome can be. The parlors were clothed in white, decked off with flowers and pretty illuminations, and the whole presented a most charming tableau. Only a few of the nearest relatives and intimates were there. And the wedding pair took passage on the Fleetwood at 4 o’clock destined for Greenbrier, White Springs, where they will abide for a few days, and then return to their home. Among the wedding gifts were: ornamental work from her own workmanship, Miss Carrie Gedge; bracelets, Mr. Harry Lendrum; pickle jar, silver stand and spoons, Warren T. Lendrum; silver fruit spoons in case, Mrs. W. H. Mackey; a case of silver knives, Mrs. J. B. Lendrum; silver jewell casket, Mrs. Boyd; silver napkin rings, “Cousin Mollie”; pitcher and goblet, Mrs. Mary B. Ryan; silver basket, Mrs. A. J. Whipps; bouquet of elegant ---, Mrs. N. B. Stephens (This is Mrs. Napoleon Stephens _who knows the B. could be Bonapart) [The various “Stephens” in the family were named for Napoleon B. Stephens – the best friend of Laurie Blakely. Thankfully the last name of Stephens was used not the first of Napoleon – whew a near miss! ]; another of same from “Dodo” Ryan. 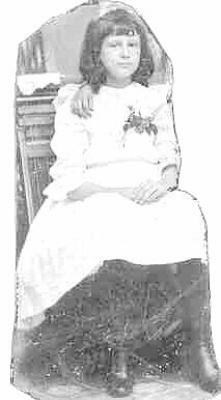 It must have been a trying few years for the newly married Lillie Lendrum and Laurie J. Blakely because their first son, Stephens L. Blakely was born on April 23, 1878, only one month prior to his grandfathers death, and their second son, Paul Lendrum Blakely was born Feb. 27, 1880, only a month prior to his grandmother’s death from what was described as a long and painful illness, and during which time she seemed to have been living with the newlyweds. In July, 1977 the Court and Probate records of Kenton County were examined to find a will or administration of the estate of John B. Lendrum, or his wife Elizabeth Rudd Lendrum, but none were found. This brings to a close the Lendrum line. The story continues with the family of Laurie J. Blakely and Lillie Hudson Lendrum Blakely. concentration of Landrum's in Scotland. Margaret McKay in Wester Alves, Scotland . Landrum was to succeed Boucher in St. Anne's Parish (Annapolis, Maryland). also a Loyalist, deserted his parish and sailed for England in 1778 . Tennent. It is also mentioned that Thomas' wife Nelly died in Dec 1803. There is no date on the papers, but the suit is clearly after 1803." His name is a guess given that his children are mentioned and one of the children is Peter. however, this could be a different Peter. Connection needs to be proved. I have the picture of Elenore Langiois in my mother's old Savary's scrapbook. Printed on the picture it states, "Father's Mother". 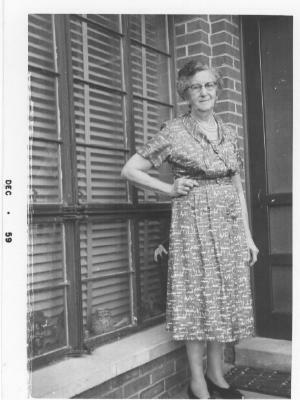 So this would then have to be Grandpa Savary's mother. I was in error. She is a full Blooded Nansemond Indan. [S304] Unknown subject unknown repository.